Most people think that they can just upload a graphic picture into some embroidery software and viola it’ll stitch out on an embroidery machine. NO. That’s actually very far from the truth what digitizing embroidery is. Essential digitizing embroidery is like tracing over an image with stitches. The software does a lot o the work. Back in the day when machine embroidery first started people had to manually punch every single needle hole to create the stitches. Modern day software figures out a lot for you. In this short video you see how I’m working on digitizing a very large logo. Basically tracing over the image with stitching. There is a lot more that I have to do to it than just lay down stitching. There is a lot of trial and error that I’ve gone though figuring out what kinds of settings do what and how what you see on the screen really looks on fabric. It’s a very complex process. Over the last four years I’ve taught myself embroidery digitizing because there are not a lot of options for learning how the pros do it. I’ve watched countless tutorials online with all kinds of software. I’ve read my embroidery software’s manual multiple times. I’ve learned a lot about digitizing but there is still so much out there I could learn and am looking to learn. Here’s is a tiny glimpse into what digitizing looks like. For those wondering I am using Bernina Embroidery Software v6. I’ve been having such a hard time getting this embroidery machine to work for me it was time to enlist some help. Since my Bernina dealer keeps cancelling my software classes I had to opt for self teaching. After reading both books from cover to cover I’ve gained new knowledge and was able to fix several issues that I was having when stitching out some of my designs. The first book Machine Embroider with Confidence should have been given to me with my embroidery machine! It was just a rehash of all the stuff I had spend the last 8 months researching and finding out on my own. The second book, Digitizing made easy, was not as comprehensive as I wanted but it was more than helpful with the digitizing process. Again another book I wish I had had months ago when I got my software. 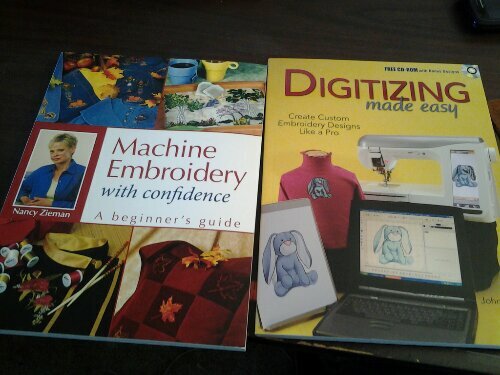 Either way I highly recommend these books for first time machine embroiders!